The international sustainable energy consultancy E4tech were commissioned to lead a location analysis project for a cutting edge sustainable energy technology. The requirement was to identify potentially suitable sites worldwide by overlaying multiple datasets. 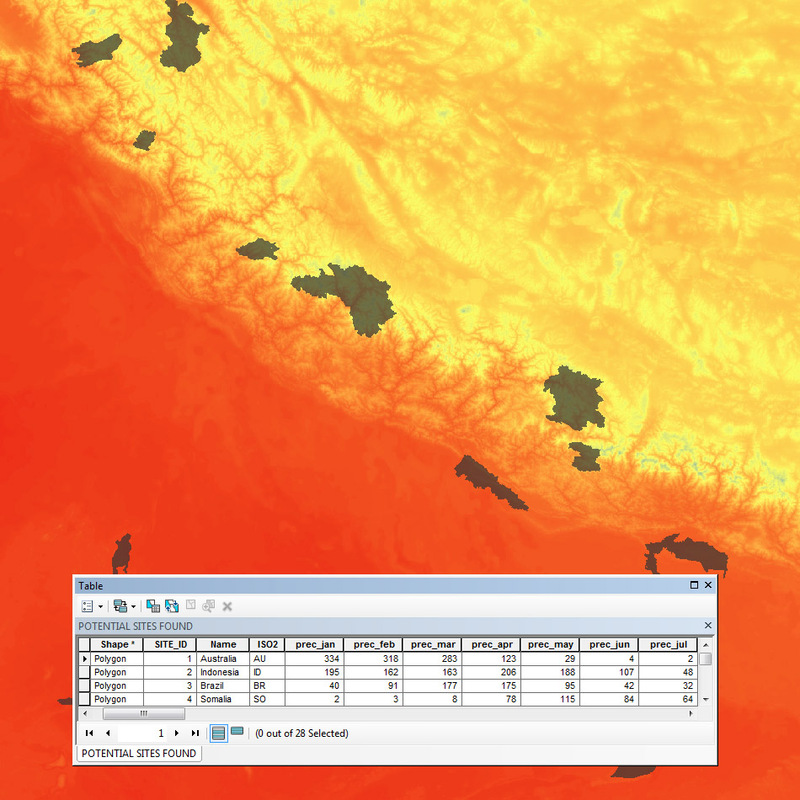 Raster layers represented environmental parameters such as sunlight and land cover. Vector layers represented inclusion criteria such as minimum distance to existing infrastructure, and exclusion criteria such as protected areas. Lovell Johns were asked to design the spatial analysis and develop this into a GIS software tool that could be run independently by the client. The client needed to be able to modify the suitability criteria and thresholds, and then see what potential sites were identified under those conditions. We first reviewed the available global datasets and sourced alternatives where these were more suitable. 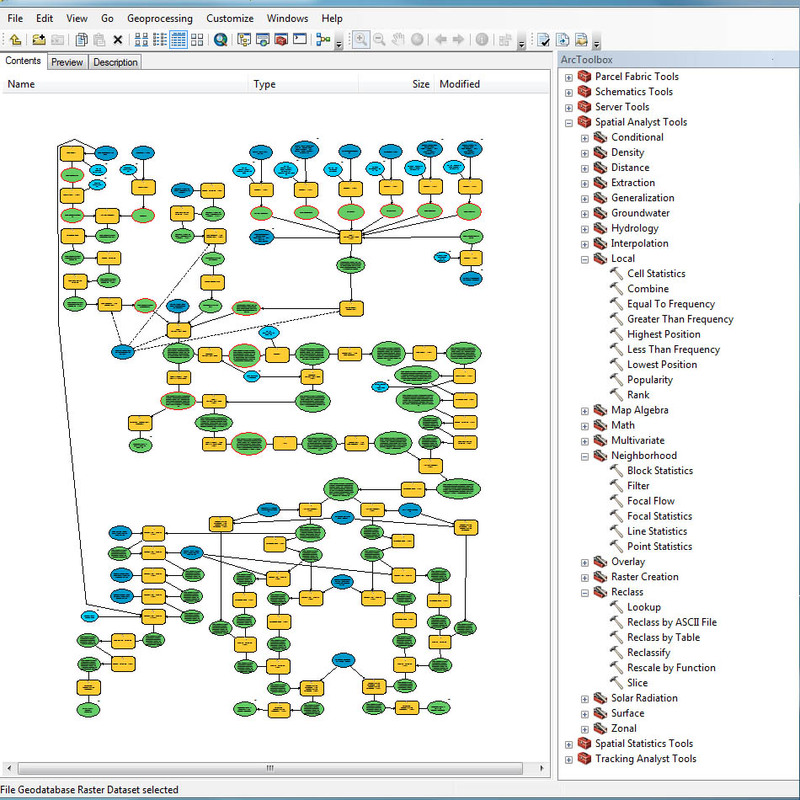 The GIS software analysis process was designed in ArcGIS, using Spatial Analysis tools for core overlay and proximity tasks. It was first built as an ArcGIS Model, allowing some initial results to be output and checked. The model was then converted into a Python software tool that could be run from ArcToolbox with just a double click. The tool generates a simple form where suitability criteria are set, with adjustable thresholds used for most criteria. Potential sites require a critical density of suitable land, again with the threshold set by the user. The tool also allows upload of additional unsuitable areas. We optimised the running time, for example by reusing intermediate files that had been created during previous runs. Results layers were added to the ArcGIS Map Document on completion, and were available to download as a spreadsheet. E4tech saw benefits from the project as interim GIS analysis findings were quickly shared early on during model development. It also allowed them to add a few extra specifications in advance of final delivery. The final software tool was tested thoroughly before deployment, both in-house and at E4tech. This helped lead to a trouble-free installation at the client’s site, where it was very quickly working to their satisfaction. We provided detailed step-by-step help guides for the tool so that the results could be visualised and explored by novice GIS users.